This live webcast is presented by Wes McKinney author of Python for Data Analysis and will be a somewhat advanced, technical talk connecting computer science concepts like data structure design and algorithms with the details of building intuitive, high performance, and flexible tools for data analysis. It is an accumulation of lessons learned and experience gained building pandas, a widely used, battle-tested data analysis toolkit for Python. Wes will give a number of short code demonstrations as a means of illustrating the various points. 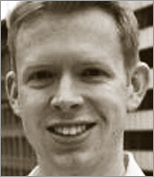 Wes McKinney is CTO and Cofounder of Lambda Foundry, Inc. From 2010 to 2012, he served as a Python consultant to hedge funds and banks while developing pandas, a widely used Python data analysis library. From 2007 to 2010, he researched global macro and credit trading strategies at AQR Capital Management. He graduated from MIT with an S.B. in Mathematics. He is on leave from the Duke University Ph.D program in Statistics.